Chef Nishi, is here in Brazil cooking for the japanese national team in Hotel. 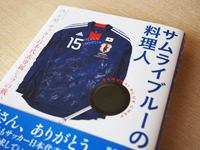 Good luck for the japanese team. He said we can get the win. Mr. Renato, Thank you for your comment. I leave Nishi in your hands. The time has come! © 広野町レストラン アルパインローズ. All rights reserved.